You’ve probably heard the saying “Every Day is Earth Day,” and it is! We should always take time to honor the Earth because if it wasn’t so bountiful and giving, we would be dead, either from lack of food or water. Not to be harsh, but it is true! With that being said, there are three important “holidays” for the Earth’s benefit that are worth exploring. Yes this awareness day has already passed, but it is important to note what the UN expects from the citizens of the world on this day. Every year in late March, the United Nations explains to us how much water people in first world countries drink a day, and how we can bring that number down. The website explains that in order to lower our water use, humans must follow a healthier and sustainable diet. This is because junk food and processed/red meat takes A LOT of water to produce.. from the actual process of making the food in a factory to feeding the cattle. Buying locally grown or fresh produce that uses less water to produce is way better for the environment. Secondly, the UN tells us to consume less water-intensive products, like products from the food industry, technology industry, and apparel industry. In my opinion, this is extremely difficult to do. If you can’t stop using these items that take up “virtual water” (water used in the production of a good or service), then try to limit water usage in your shower or clothes washing process. 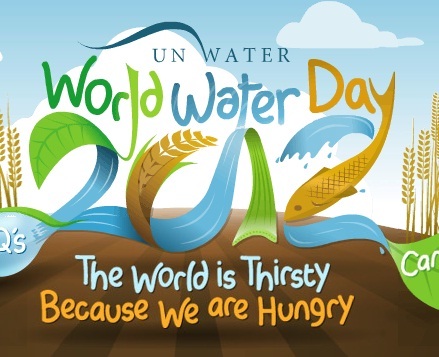 All in all, the UN stresses that food production creates the most water and virtual water usage. Basically, turn off the tap! Environmentalists have been saying that for years. It’s literally as easy as turning off the faucet when you’re brushing your teeth or doing 1 large load instead of 4 little ones. It’s that simple. FOLLOW THEM: @UNW_WWD, Facebook, YouTube, and Flickr. This is a day that is a little less known to the general public. Every year, for an hour on one day in March, people pledge to turn off the lights, televisions, computers, and anything else that uses electricity in order to create an hour of darkness. The purpose of this is to enlighten people (no pun intended) to “display a universal commitment to protect the one thing that unites us all — the planet.” This day was also made with the intention of raising awareness for global warming, which is caused by human activity and electronics. Last but certainly not least is Earth Day. This is they day where it is okay for environmentalists and regular citizens alike to join hands and rejoice to the world.. No, I know that doesn’t happen. Actually, nothing happens past kindergarten after we make finger-paintings of trees and mom and dad hang them on the fridge until replacing them with a new drawing. Now that I think about it, Earth Day is a day where everyone on Facebook posts a status about recycling or saving the Earth. The truth of the matter is, the Earth is in trouble, and no amounts of finger-paintings or Facebook statuses is going to stop the beauty and bounty of the Earth from declining. Water is rapidly disappearing, global warming is increasing slightly every year, and many of other environmental causes plague our world. On the Earth Day website, you can also share your pledge to help save the planet along with the 800 million people who pledged acts of green. I’m done with my tree-hugger rant now! This year, make your mark on Earth Day, as the other two have already passed. Post a link on Facebook or donate your status on World Water Day next year. The only way to turn around the damage we have done to the Earth is to raise awareness. Me, as one single person, can’t make a whole lot of tangible difference, even if I do rent my books from Chegg, who plants a tree with the completion of my order, but I can raise awareness through my Twitter, Facebook, and blog. All it takes is a few seconds to tweet something meaningful! Make your social media voice count on Earth Day 2012.